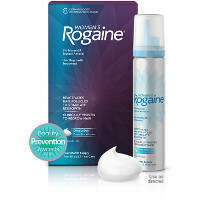 Regrow thicker, beautiful hair with Women's Rogaine Hair Regrowth Treatment. This foam reactivates hair follicles to regrow hair. The only once-daily hair regrowth treatment for women approved by the FDA, this formula is proven to help regrow hair in over 80% of women, with clinical results in as little as 12 weeks and visible results with continuous daily use after 24 weeks. Use only as directed. You must click on the offer to get the printed coupon.